I prepared this dessert for a Mexican themed evening with my Girl Gang. It looks absolutely amazing and it’s super easy to prepare. I was looking for some Mexican dessert online, but I wanted something less complicated than flan. 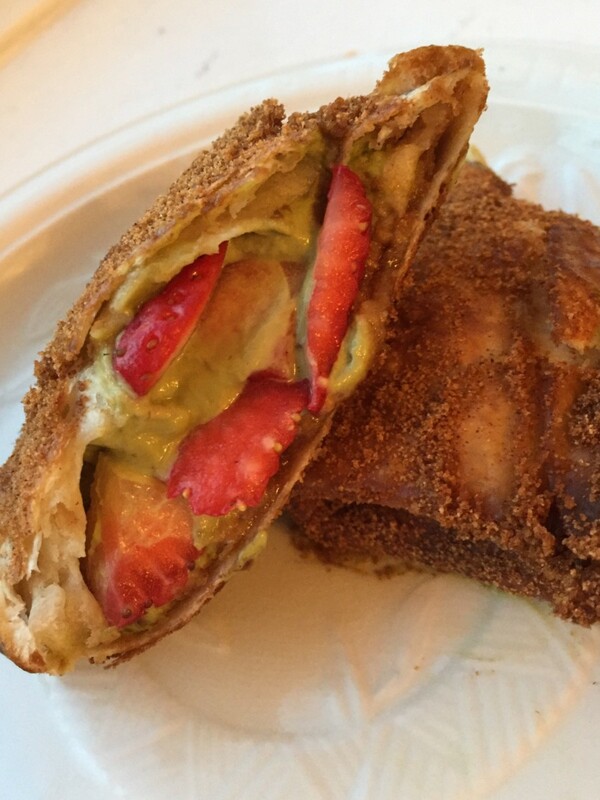 Then I remembered Ashlee Marie’s Cream Cheese Chimichangas, they are simply irresistible and I tried them before. 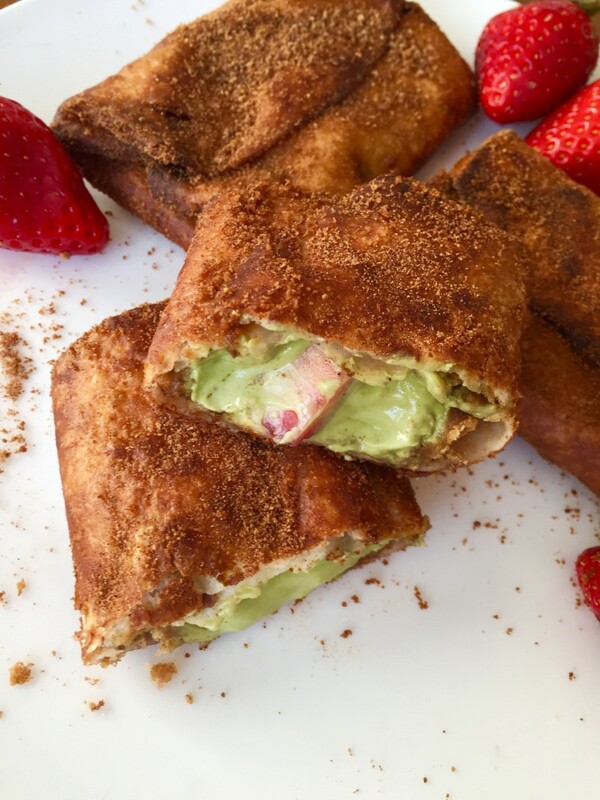 But this time, I wanted a twist, so I swapped white granulated sugar for healthier coconut sugar, added strawberries and matcha green tea powder. The outcome is sweet and creamy, a lovely combination of juicy strawberries and subtle bitterness of the matcha green tea. And the colours are fabulous! I believe this filling would work great with crepes too. Trust me, it’s super easy. Looks very complicated, but it isn’t at all. All in all takes about an hour to make them. Crush the digestive biscuits. Put them into a clean plastic bag and use a rolling-pin. It doesn’t matter if they are not perfectly and evenly crushed. Make sure the cream cheese is room temperature when you start using it. With a food processor, beat the cream cheese, the coconut sugar, the matcha powder and the vanilla extract all together. Beat the egg in a cup, scramble, then add it to the mixture and lightly mix it in with a wooden spoon. Lastly, fold the strawberries into your batter. Prepare your coating sugar, by mixing the sugar with cinnamon. Start filling your tortilla wraps. 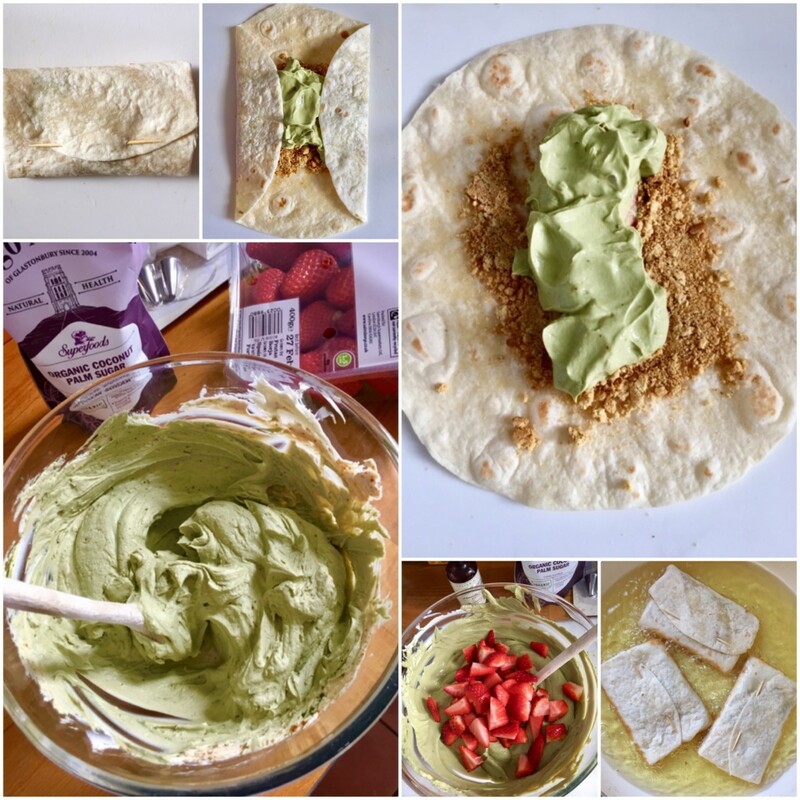 Lay out a tortilla wrap, place 2 tbsp biscuit crumbs in the middle and put 3 heaped tbsp of batter on the top of it. Place them right next to each other, quite tightly, so they would form a rough rectangle shape. See photos. Fold the sides, I formed small envelopes, which I quite like. Secure it with a toothpick. Heat the oil and fry them on 170C. It only takes 2 minutes each sides. Keep an eye on them, they can burn quickly. Roll them in the cinnamon sugar. I had to reheat them to serve them at the party, it was good, however not so good when cold. Obviously, the best when served immediately. I dont know how on earth you ever came up with this- but it sounds and looks so good. 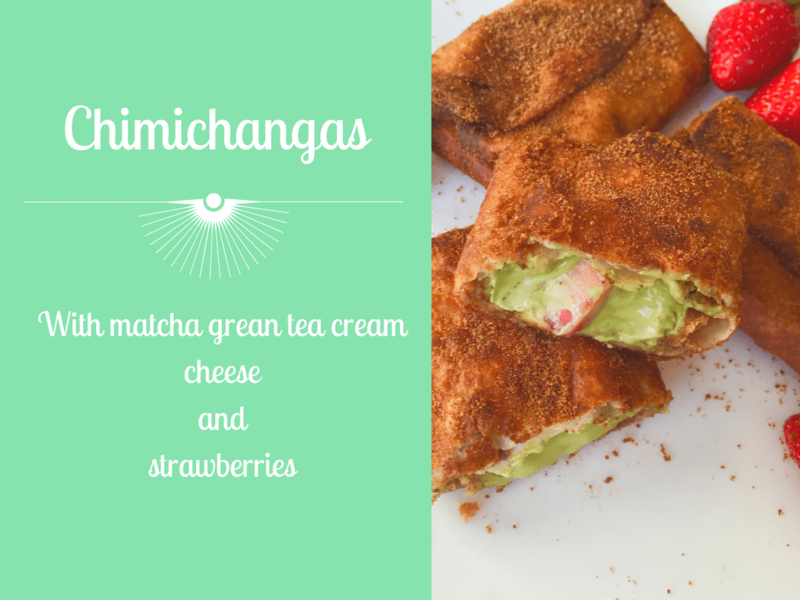 It’s the first time I hear about chimichangas, but they look fab and I think they must be delicious too. 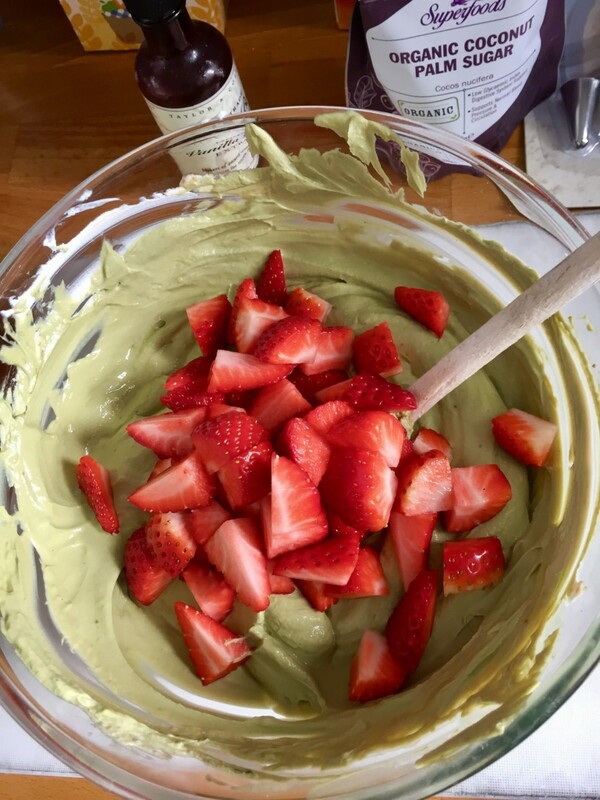 I like matcha and I think it’s a flavour that goes great with strawberries. so glad you enjoyed my recipe! this change up sounds awesome! I bet it was a huge hit! It worked out quite well, maybe a tiny bit less frying time next time. 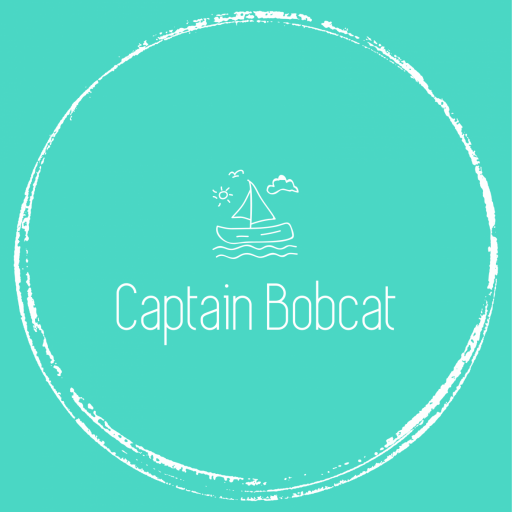 Thanks for your lovely comment! Thanks ? Glad you liked it.